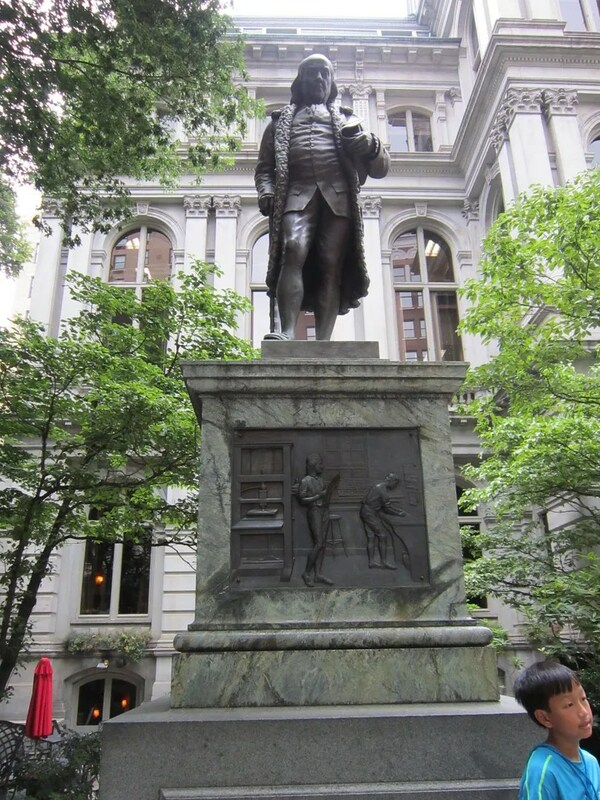 2013 Road Trip Photos #7: Freedom Trail, Part 2 of 3: Statues « Midlife Crisis Crossover! 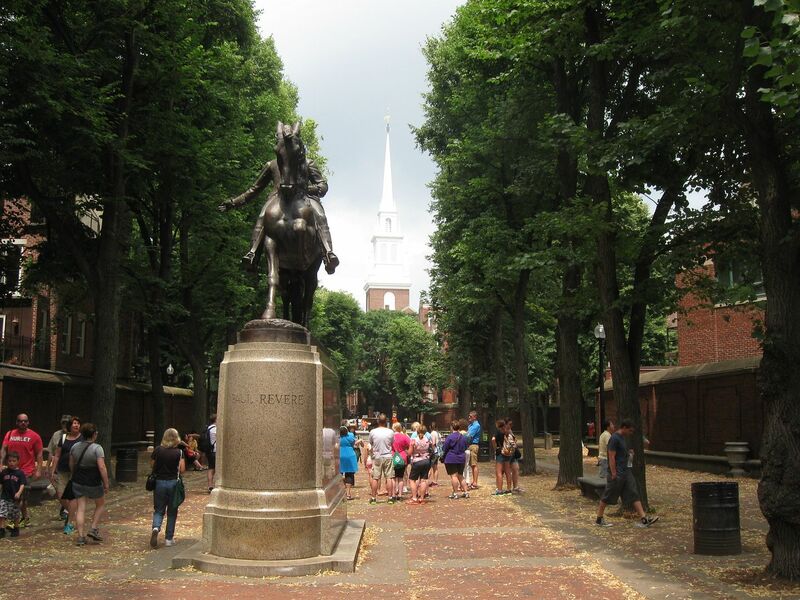 Previously on Midlife Crisis Crossover: we began Day 3 of our vacation by walking two miles or so along Boston’s Freedom Trail, which winds its way through its centuries-old heart and guides you near the most talked-about points of interest. The only trick is you have to remember to look up from your map so you can see and appreciate them instead of passing by them obliviously. 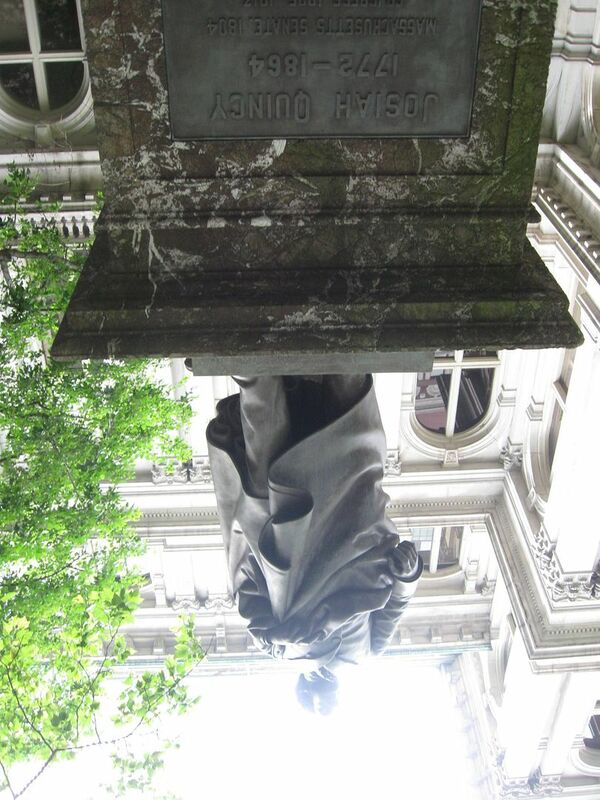 Wherever you find history, you’ll find statues. Tonight’s episode collects our views of the inanimate guardians who glared at us along the way, but thankfully didn’t come to life and try to scare us out of town. For example, you may recognize this famous thinker from such popular works as HBO’s John Adams, The Office, and the American $100 bill. 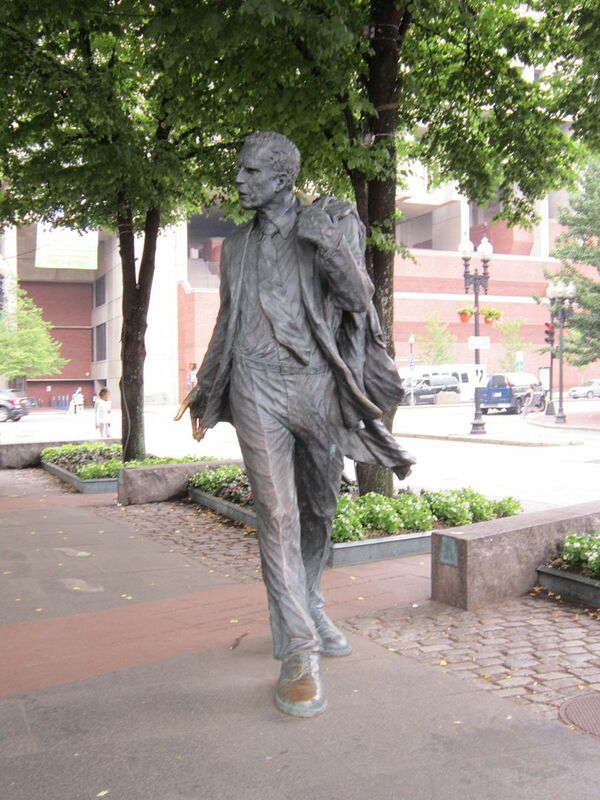 In the same yard but lesser known outside Massachusetts is Josiah Quincy, who was at various points a senator, a Congressman, a judge, Boston’s mayor, and president of Harvard University. Apparently today’s young males aren’t alone when it comes to having a hard time picking a career and sticking with it. The tombstone of statesman Samuel Adams guest-starred in our previous chapter, but a reasonable facsimile of his corporeal form stands at attention in front of Faneuil Hall, an eighteenth-century meeting place that’s now a city market — i.e., like a shopping-mall food court except with no clothing stores inside. 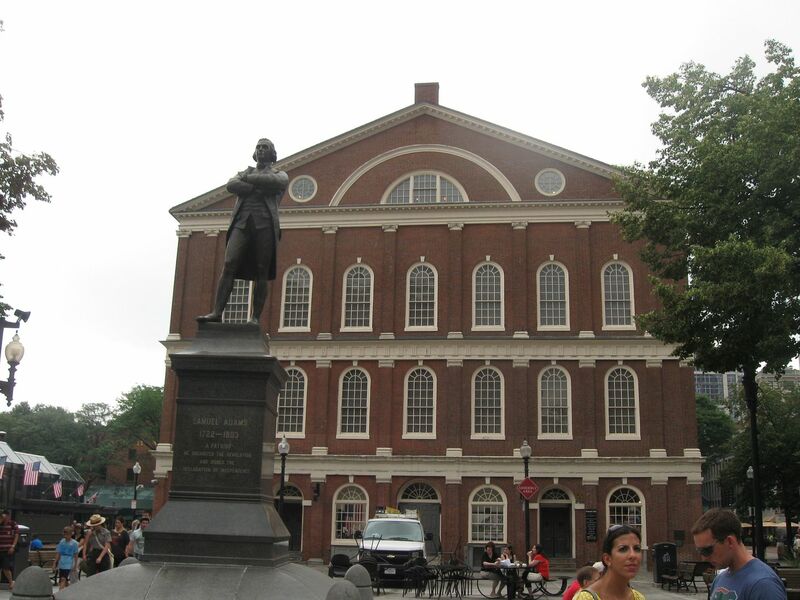 Other statues congregate around Faneuil Hall, most of them less recognizable personalities. What has two thumbs and remains anonymous to us? This guy. Further down the trail, Paul Revere is immortalized in the courtyard of the Old North Church. 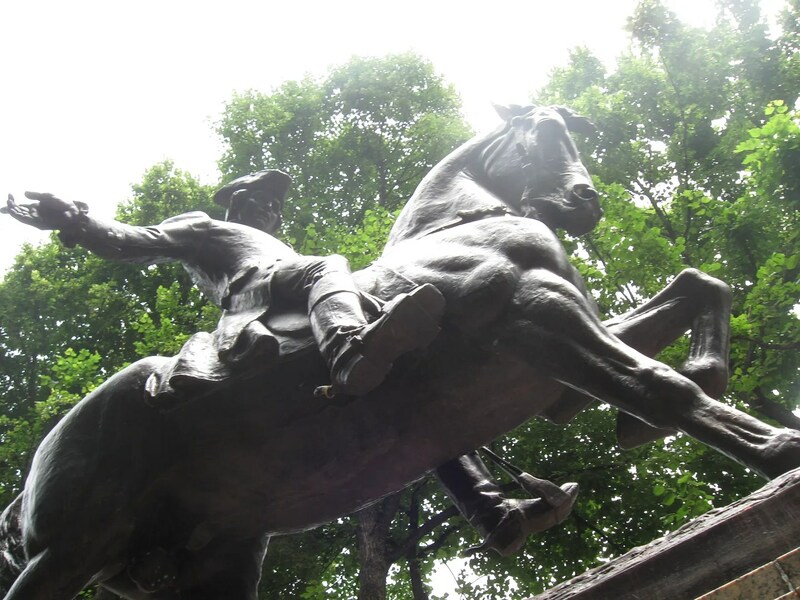 When this man tells you the Redcoats are coming, you do not shrug it off and pretend nothing’s wrong, or else his trusty steed will stomp you into patriotism. 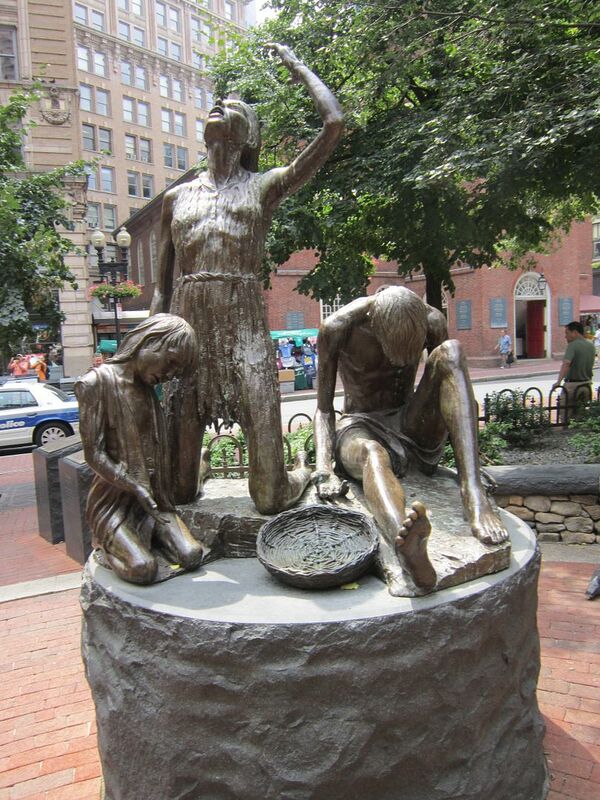 This piece is called the Boston Irish Famine Memorial. As far as I know, none of these anguished figures are historical celebrities. 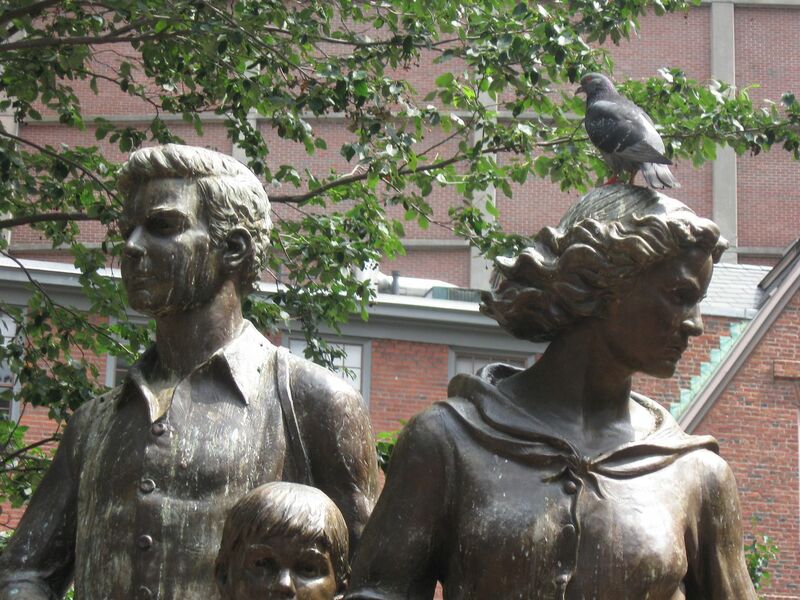 Next to that memorial is a second version, representing how their life improved once they emigrated to America and never knew hunger, poverty, or squalid living conditions ever again. The live, disrespectful pigeon lends a touch of uneasy skepticism to the piece, and seems an odd choice on the artist’s part. 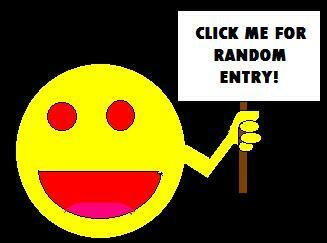 As a token gesture to non-humans in the audience: it’s a donkey! 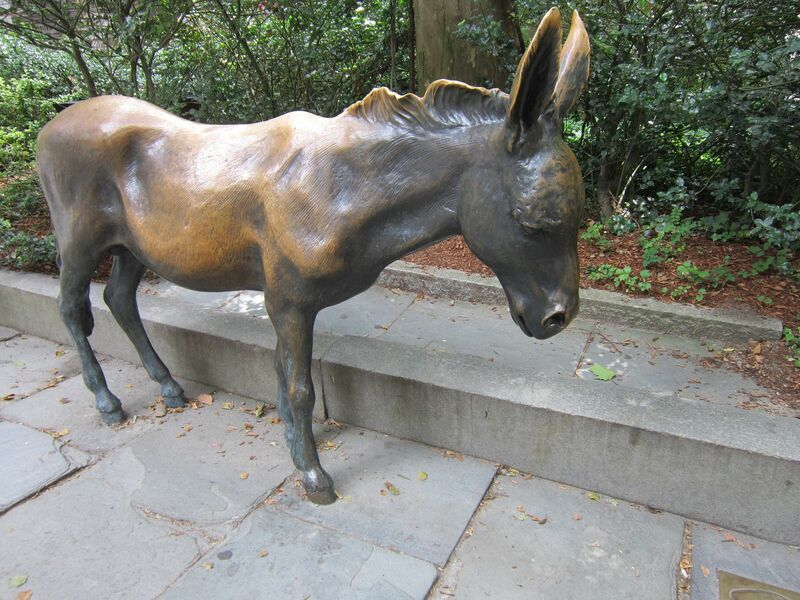 The mascot known as “Democratic Donkey” stands in front of the Old City Hall, waiting to engage in battle with any elephant statue or Shrek toy that dares invade his turf. Visitors are welcome to stand in front of the donkey and stare it down. 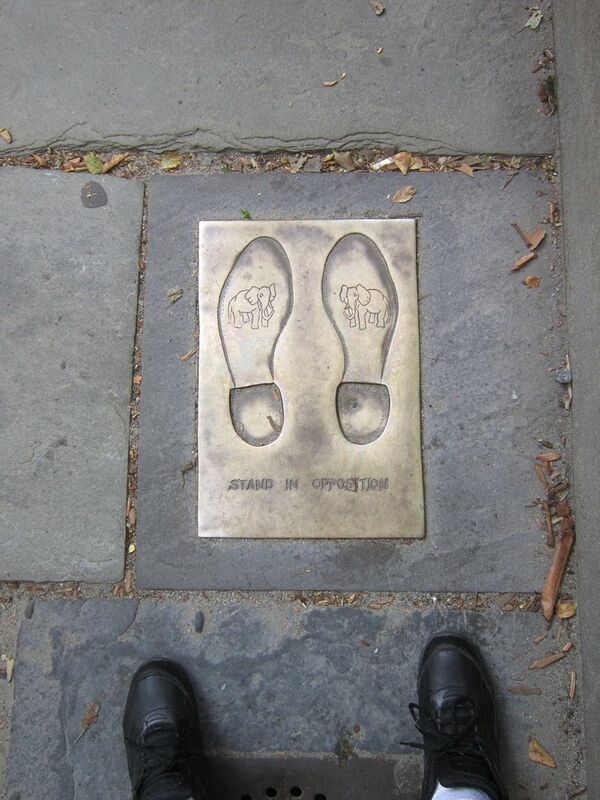 Footprints are helpfully embedded in the spot for any Method actors who might need a “mark” to hit. 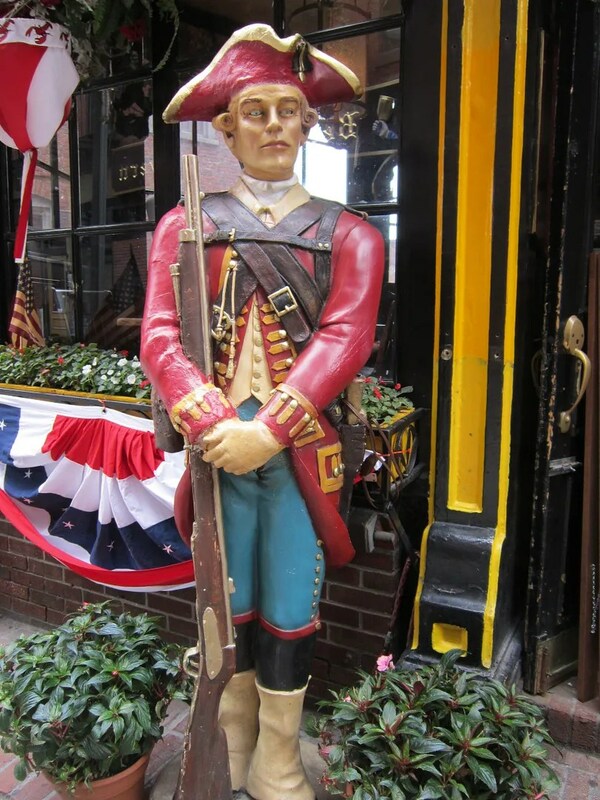 If you prefer your statues in something a little more effervescent than gunmetal gray, some of the quaint little pubs and shops along the Freedom Trail have their own ideas about how our nation’s history was colored. Useful side effect: anyone specifically seeking this joint will be able to spot it from seven hundred yards away during a foggy midnight power outage.